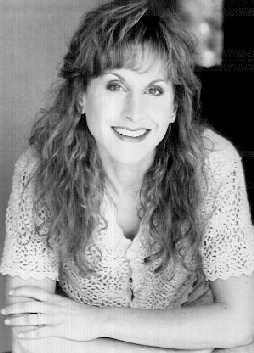 SPLICED interviewed Jodi Beson on November 2, 1997 in San Francisco. Imagine being perky for a living. Imagine being called on to singing the same four or five songs over and over again for eight years. Imagine being eternally sixteen -- in animation form, at least. This is what it's like to be Jodi Benson, the voice of Ariel, Disney's "Little Mermaid." But she doesn't seem to mind a bit -- she makes a comfortable living off that half-fish, half-teenybopper. Ariel has been her bread and butter since "The Little Mermaid" became the Renaissance of the animated musical in 1989. She has performed Ariel's voice for video sequels, a "Mermaid" Saturday morning cartoon and on albums. She does get other work -- for three years she was on Broadway in a musical called "Crazy For You" -- but she continues to make personal appearances and do conventions on behalf of "Mermaid" merchandising. Now comes the big push. Disney is re-releasing "The Little Mermaid" this weekend, and Benson is on a publicity tour. A good Disney soldier (she refers to the studio as "The Company"), she's even willing to meet late on a Sunday night to talk about her life as a mermaid, even though she has a 5 a.m. wake up call to do a hip hop morning radio show. "I'm going straight to bed after this," she says as she settles in to reminisce about the making of "Mermaid" for probably the 100th time this month. "I have a big day tomorrow." Benson's resemblance to Ariel is slight, especially dressed in a T-shirt and chinos. In her mid-30s, she is undeniably adult, but there something about her that calls to mind the word "cute." It might be the way she smiles when I point out that, thanks to the movie she gets to be 16 forever. "That's right," she laughs. "That's a very good thing." "The Little Mermaid" is a classic fairy tale put to music. It would never work as a live action movie in a million years, but under the deft direction of Disney, it's one of the best animated movies ever. Based on a Hans Christian Andersen story, Disney's take on the tale of a lovelorn undersea teenager finds her falling in love with a handsome prince (naturally), being chaperoned by a wise-cracking crab and tormented by the fabulously wicked Ursula, an octopus/opera singer who wants to take over the sea. When "Mermaid" was in pre-production, Benson was working on Broadway with Howard Ashman, the movie's producer, which is how she began down the road that lead to being the voice of a Disney legend. "He invited all the girls (in the show) to audition for the movie," she explains. "We submitted the tapes without our names and our faces. Each person did the voice they thought she would have, and recorded the song that Howard had put down on tape for the audition." The song was "Part of Your World," one of the most hummable tunes from the movie. Does she ever get the songs from the movie stuck in her head like the rest of us do? "I do sing them all the time (professionally), but I don't hum them. They're not something that rolls around in my brain, which is probably good...so I don't O.D. on them." Benson attributes the songs, among them "Part of Your World," "Kiss the Girl" and "Under the Sea" as one of the biggest reasons "Mermaid" breathed new life into feature animation. "It was the first (animated film) to add this whole element of Broadway music. It was a first for this to be approached like a play, like a musical, as opposed to just a script." This approach was largely the brainchild of Ashman, who produced and co-wrote songs with the late Alan Menken. Whenever she's asked about her memories of making the film, she says her thoughts turn to Ashman. "The fondest memories I have are of working with Howard." Benson worked closely with Ashman developing Ariel's character voice. Although the animators videotaped her recording sessions to incorporate some of her physicality into the character, she never saw much in the way of art until she attened the premiere. "Wow. It was very nerve-wracking initially. Like white knuckle turbulence -- flight it what it felt like," she says. "But then I forgot that it was me, and I was able to get caught up in the story. "I think I was just amazed at the translation from the Broadway concept into a film. How they could take this musical, put it into an animated feature film, and have the audience applauding after numbers like they were in the theater." The return of "Mermaid" to the big screen invites comparison to the animated films that followed, but Benson isn't the type to open a can of worms. When asked if she has a favorite Disney movie, politely sites the merits of each of the films that followed her own. More specifically, I ask her about the formula Disney seems to use in each film: A young hero(ine) with one or no parents, comic relief from animal sidekicks, a very bad baddie who is amusing nonetheless, love at first site, a handsome but dopey male lead, an element of the supernatural, and so on. "I don't think they're all exactly the same," she says in defense of the company. "I think they've taken a successful formula and tried to expand it in different ways so as to not be repeating it step by step. But obviously it does work, so they don't want to steer too far away from that." She also tows the company line when the topic turns to the apparent rivalry between Disney and other studios that are now starting to create lavish animated musicals, like "Anastasia," coming out next week from 20th Century Fox. "I don't think that there's a competition as much as 'Let's just get good stuff out there.' And if animation is a good field, a big box office seller, then lets get more of it out there. It doesn't have to come just from Disney." For a few days at the end of this month, Benson's voice will be featured in two Disney movies at once. Hers is the voice of a "flying saucer/personal computer" called Weebo in Robin Williams' "Flubber," a remake of "The Absent-Minded Professor." I ask her what she thinks of Disney's recent rash of remakes, and she seems excited about that, too. "Oh, I think it's good. It's nice to have a twist on some old things," she says. "I hope they bring back, like, 'Herbie the Love Bug.' If they updated that, that could be really fun." No doubt there is someone at Disney exploring that possibility right now. Perhaps Herbie will talk in the remake...with the voice of Jodi Benson.